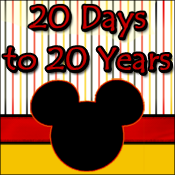 This weeks Wordless Wednesday is all about food in Disney. So why have I posted an outfit of clothing? I have been playing lately with clothes in an artful way to express some of my favorite Disney places, characters, feelings, and yes-- even food! The Dole Whip is almost as iconic as Mickey himself when it comes to Disney (ok...not really almost, but you get my drift- The Dole Whip has a following)! So take a gander and tell me what you think! I believe it looks nearly good enough to eat! 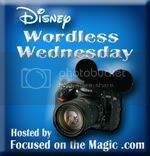 Thanks to Deb at Focused on the Magic for hosting this blog hop every Wednesday! Click the button below to follow along! Don't miss a minute of the magic! Give us a *Like* on our Facebook page! Thanks! Yes, I definitely want that in my closet! What a creative photo arrangement - it looks great! I have never eaten a Dole Whip but I'll assume they taste great too! A fabulous interpretation of this week's theme. Looks like a perfect outfit to wear while relaxing with a Dole Whip! Thank you! I believe I may try that next time! Oh Deb, you could rock the dress! Sadly, I have to confess that I'm not a fan of the Dole Whip. I am, however, having a really fun time envisioning one through your clothing montage. Very creative! Very creative, your outfit really looks like the Dole Whip! What a cute outfit! It's very summery and definitely reminds me of a Dole whip especially the earrings. I'm not a fan of Dole Whip either - more of a chocoholic.